Place a bet on your hand of cards totalling 21 or closest without going over. Ace cards can be worth 1 or 11, and face cards (Jack, Queen, King) are worth 10. Between rounds you can Hit (take another card) or Stand (play the hand you have). The strongest hand, or "Blackjack" is a 10 card and an Ace. You can bet up to $100 per hand, in increments of $1 or $10. You can Double Down to double your bet if you are confident of winning a hand. If you win the hand then the money is added to your wallet, and if you lose then the money is subtracted from your wallet. A game of Blackjack against a computer-controlled dealer. 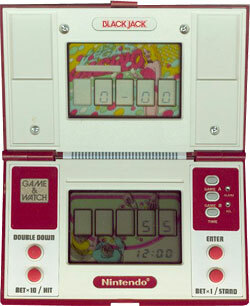 A number matching game similar to a fruit machine. As the numbers scroll through 3 to 7, press the buttons to try and stop them on the same number.